“I’ve been in the makeup industry for over 25 years, and I’ve been doing work with some of the biggest movie stars in the industry. One of the most prevalent issues that kept coming up was trying to get rid of wrinkles around the chest area, caused by sleeping on one’s side, the sun and just plain gravity. If a scene called for a movie star to be in a bikini or a low cut dress, I had my hands full trying to get rid of these wrinkles. I had used silicone quite extensively in mold making and prosthetic application, and I noticed how the use of silicone had healing and softening properties when used directly on scars. With more research, I found that Silicone gel sheeting was being used to heal Keloid scarring. I wondered if I could use silicone to treat wrinkles as effectively. So after experimenting with silicone, I developed my first prototype of the Decolette Pad. I used absolutely no fillers or adhesives so that my product could be used on the highly sensitive chest area. Once I tested this thoroughly, I was extremely pleased that I had made a product that was easy to use, lasted a long time and is non-invasive. Best of all, it cost a fraction compared to using surgical alternatives. 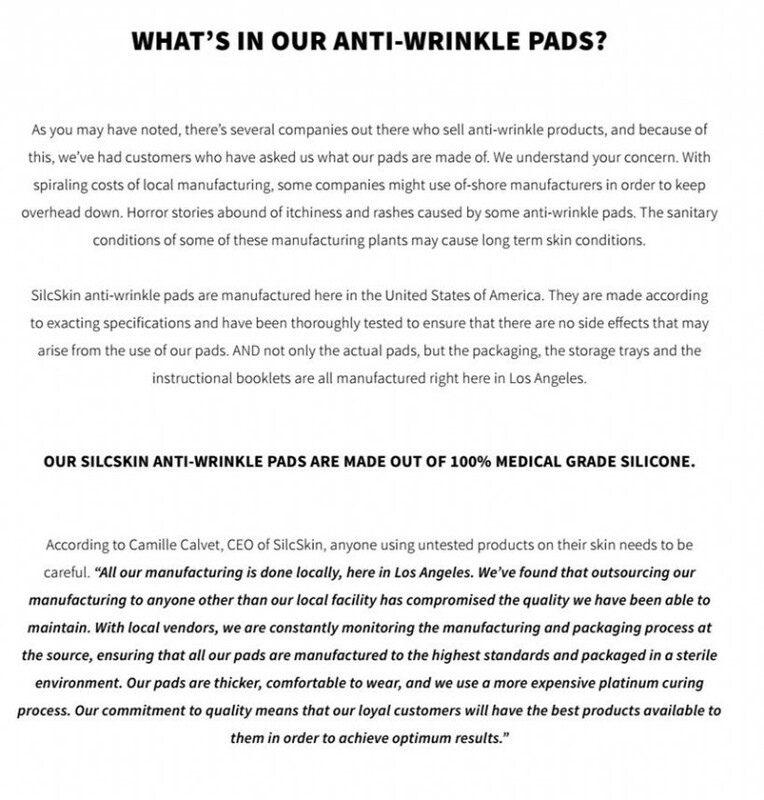 The SilcSkin Décolletté Pad™ was conceptualized by twice Emmy Award winning Hollywood make-up artist, Camille Calvet. With over 25 years of experience in the makeup industry, Calvet has worked with some of the biggest movie stars such as Cameron Diaz, Penelope Cruz, and Jennifer Aniston. Calvet states, "If a scene called for a movie star to be in a bikini or a low cut dress, I had my hands full trying to get rid of these wrinkles." As a special effects makeup artist, Calvet worked extensively with silicone and discovered the healing and softening properties when applied on scars. "With some research, I found that Silicone gel sheeting was being used to heal scarring. I wondered if I could use silicone to treat wrinkles effectively." This specifically designed, much sought after restorative and preventative product is an essential part of many a celebrity and movie star's Red-Carpet-Ready Kit!